Nick far exceeds his basic status of adorable 3-year-old; he is also a relentless personal trainer. We ran sprints across the living room from 7:30-8 this morning, followed by weighted leg lifts (I on my back, Nick as the airplane perched on my feet), and, with an abbreviated repast–chocolate milk for him, coffee for me, and muffins for us both–finished with a solid 45 minutes of dancing to to the Laurie Berkner Band. To make up for the loss of calories, I decided to puree the somewhat sad, but still edible, strawberries lurking in the produce bin of our refrigerate. 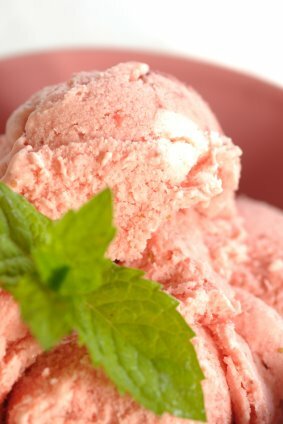 My intent was crystalline: churn a batch of Perfect No-Cook Strawberry Ice Cream. As soon as I perused this month’s Gourmet magazine, I knew it was only a matter of days before it came to fruition. Granted, I almost always look at the desserts in the index first, and the code words “perfect” and “no-cook” grabbed my immediate attention. The only downside to my adventure is that the recipe I concocted strayed far from the original. It was unintentional, for the most part. I don;t like chunks of fruit in my ice cream (icy obstructions), so I had planned to puree all of the strawberries after first reading the recipe. But what ensued next was unintentional, perhaps caused from my post-workout routines with Nick. I was trying to prep some of the ingredients while playing with Nick, and after a quick glance, I was sure it said “3/4 cup fresh lemon juice.” I was so pleased, because I had carted two dozen large Meyer lemons, straight from my parents’ tree, back to Texas, and had not decided how to use them. squeezed away, and immediately emptied it into the puree. I couldn’t remember how much sugar was required, so I took a longer look at the page. It was then I realized my mistake: it was supposed to be 3/4 TEASPOON lemon juice, not 3/4 CUP. Oh crud. After a few moments of modified curses (e.g., “crud” and “jiminy crickets”), I resolved myself to making the most of it (or, as my Grandfather was known to say in his powerful tenor voice, “Carry on!”). So I did. I upped the sugar to 1 and 1/2 cups (instead of 3/4 cup) and increased the cream from two to 2 and 1/2 cups. After mixing, I let the whole thing chill for 4 hours. I was feeling fairly confident, because the mix was fantastic. My only worry was whether it might be too icy. After a brief spell churning, all worries were dispelled. If I could jump up and down inside this post I would, because the results were phenomenal, if I do say so myself. Puree the strawberries in a blender until smooth. Transfer to a large bowl and stir i the remaining ingredients. Chill, stirring occasionally, until very cold, 3 to 6 hours. Freeze mixture in ice cream maker. Transfer to an airtight container and put in freezer to firm up. Makes about 2 and 1/4 quarts. Looking at your picture is making me crave ice cream…yummy! I love delicious mistakes! Great job. Looks fantastic as always Camilla. I didn’t even realize you could make a no cook ice cream. I learn something new everyday.